This family-friendly dinosaur discovery adventure combines the best of Vail whitewater rafting with fossil hunting for a prehistoric journey like no other. Raft back in time more than 150 million years along the beautiful Colorado River, where you’ll see and touch footsteps, bones, and other remnants of the great dinosaurs that once roamed Colorado. Rafting through the Upper Colorado River’s mild rapids adds fun to an educational experience that digs into the history of Vail’s dinosaurs. Timberline Tours teams up with Fossil Posse on this trip to provide world-class rafting guides and dinosaur experts who will shape adventurers of all ages into paleontologists for the day. The trip will begin with transportation to Rancho Del Rio on the Colorado River, where all guests will outfitted with required rafting gear and then begin their river journey. After enjoying a family-friendly rafting trip from Rancho Del Rio to State Bridge, guests will have lunch together and then spend the afternoon on a dig at the Fossil Posse bone quarry, where they’ll discover and collect exciting finds including fossil shark teeth, ammonites, and fossil bone pieces. Other afternoon activities include fossil casting, geology talks, fossil presentations, and meeting a living fossil, Fossil Posse’s giant snapping turtle. 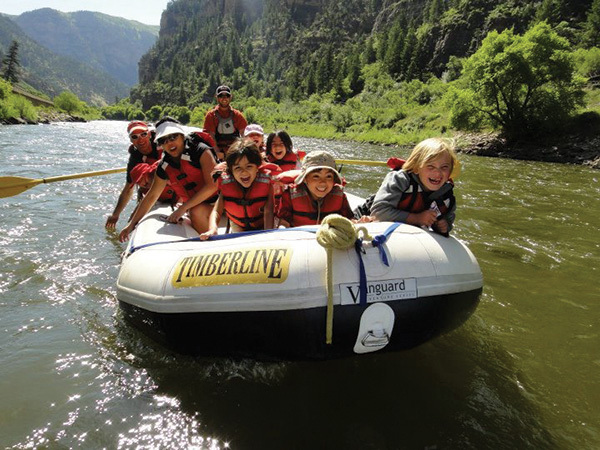 When school’s not in session, this rafting trip provides a great way to make learning fun for all ages. It’s hands-on, expert led, and the stuff of a true Colorado adventure. For visitors and locals to the Vail area, this outing will be a memorable way to connect with an exciting history that’s both local and global. This rafting and fossil hunting trip is offered on Tuesdays, Thursdays, and Saturdays during the summer season for all adventurous guests ages 6 and above, and it’s also a great way to celebrate a birthday party, family reunion, or special event. The minimum age for this trip is 6 years old.